We are Sense Massage Therapy, the UK's experts in on-site chair massage, and we're here to make your business better. Whether you want to boost staff morale or make your next marketing event a hit, mobile massage can help you engage employees and customers alike. 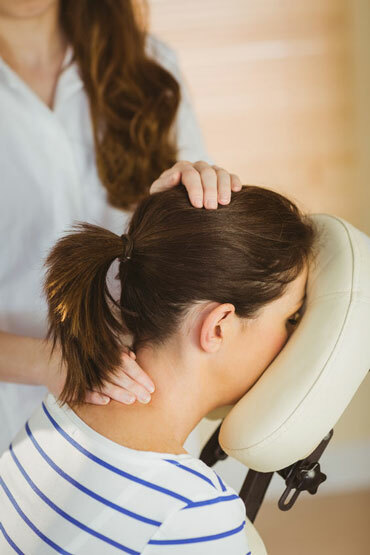 A simple, flexible solution that requires minimal space, our massage services can help you create a lasting impression on all who are involved to nurture an atmosphere of care around your brand or business. Hundreds of companies across London are already utilising on-site massage in the office as part of employee wellness programs, as one-off bonuses or motivational incentives or to improve staff retention. Treat staff to a chair massage, reflexology treatment or an indulgent Indian head massage and see the results for yourself. As well as providing office massage within companies, we also offer on-site massage for corporate events such as corporate dinners, in-house events and team-building days, where massage can be easily incorporated into your schedule to bring an extra enjoyable element to the day. The power of touch will leave your guests refreshed, relaxed and ready for whatever you have planned next, and will make the day ever memorable for both staff and customers. Similarly, utilised as part of marketing promotions or campaigns, massage is becoming increasingly popular as events companies and marketing teams realise the power it has to engage customers. Use massage to draw in new customers, start that all important first conversation, offer something that has immediate benefits and build trust. There are so many ways massage and wellness can be worked into your brand message, and those who have tapped into this through our services, have all seen fantastic results. Some brands we've worked with include Volvo, with whom we did a huge UK tour in 2017, Barclays, Stagecoach and more. Where Do We Provide Corporate Massage in London?